Her comments came with the unveiling of a broad approach to tackling extremism in the UK. May said while extremism exists in racism, anti-Semitism and homophobia, Islamic extremism is the greatest threat to the country. Her plans did not include handing ministers powers to tell educational institutions to ban extremist speakers, a measure staunchly opposed by her party’s coalition partners, the Liberal Democrats. “Everybody living in this country is equal and everybody is free to lead their lives as they see fit,” she told an audience in central London. “We are free to practice any faith, follow any religious denomination, or ignore religion altogether. “We are free to wear whatever clothes we choose. We are free to establish our own faith schools and give our sons and daughters the best education possible. We are free to build our own churches, temples and mosques and worship freely,” she said. May added that with the freedoms offered by British society comes the responsibility to respect others’ values. She said the “overwhelming majority” of people in the country “accept and positively cherish” the arrangement. “But there is increasing evidence that a small but significant number of people living in Britain – almost all of whom are British citizens – reject our values,” she added. She warned of growing levels of Islamic extremism spreading throughout the country, citing examples of the Trojan Horse plot to take over Birmingham schools and allegations of extremist ideas being promulgated in schools. 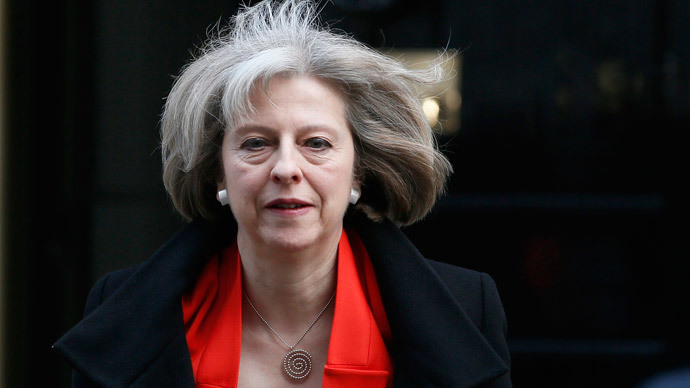 May has been responsible for introducing a plethora of new counter-terror measures, including seizing suspects’ passports. But she has been criticized for implementing policies that unfairly target the Muslim community. May also said those who follow Islam are “entirely compatible” with British values, but added there is a clear distinction between followers and extremists. She called on Muslims to tackle the “intolerance, hatred and bigotry” of extremism, which “erodes” women’s rights and “discriminates” against race and sexuality. “Government cannot act alone. Individual people, families and whole communities need help and those of you fighting the extremists deserve our support,” she said. The home secretary sent a clear warning to extremists: “The game is up. We will no longer tolerate your behavior. We will expose your hateful beliefs for what they are.